What a chilly day today! It's hanging just under 30 below and refusing to rise. Josh is working 12 hour shifts this week getting equipment ready for Prudhoe Bay. I haven't gone out much this week because of our record low temperatures and Fynn's cold, but everyone's going stir crazy. Fynn gets grumpy when he doesn't go outside a lot and the dog really needs to run off some energy. Even the cats try to go outside, but when we open the door for them, they just flatten their whole bodies against the blast and glare at us like, "why won't you make it warmer!?" Not in my power. I’m finding a lot of baby stuff is expensive! The only mobiles I could find were all well over $50! Not exactly in our budget right now, but I could see that Fynn would enjoy something of the sort. 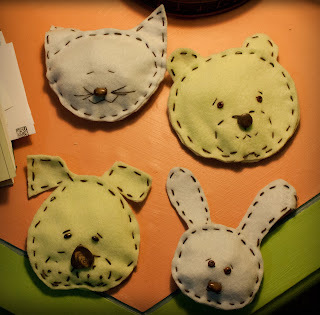 I’ve had these fleece scraps laying around that I’ve been going crazy with lately. Fleece is so forgiving, I love it! Anyway, a couple naps later, I had a couple simple animal faces, but you could really do any shapes. Then I filled them with what I had lying around: Some old pasta noodles and the fabric scraps from making them. You could use real stuffing, beans, filler popcorn, whatever. Next came a couple of willow swatches from outside. 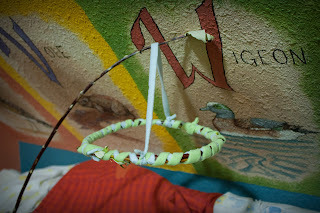 I used more of the fleece strips to lace around two, making a hoop. A third long swatch was tied to the top of the bed. Then, it was just a matter of tying the portions together, allowing enough length for swinging and swatting. Fynn really loved this (as did the cats), but it held up! =) Note: This was perfect while Fynn was in his batting stage. 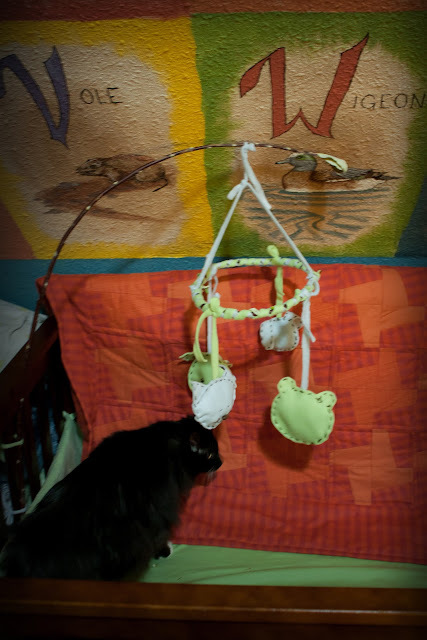 Now that he's grabbing everything and putting them in his mouth, this mobile has sadly been removed, but Fynn is interested in different toys now, anyway. Perfect for that stage, though!